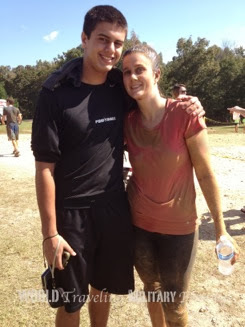 Well I did it, I finally ran a Mud Run and am able to cross it off my Bucket List! 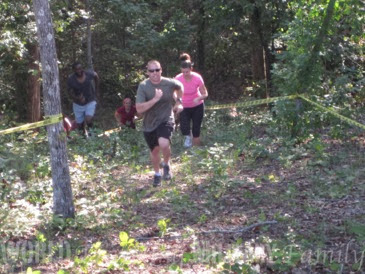 This past Saturday we ran the Almighty Mud Run put on by Bridges of Faith in Billingsley, AL. Not only did we get to run a Mud Run but we were also supporting a ministry that brings Ukrainian orphans here to the US to be adopted. 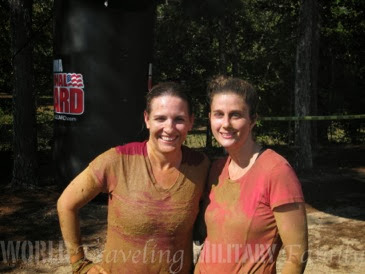 My biggest obstacle to overcome in being able to run the Mud Run was finding someone to run it with me! Last time they had it Mr. B was still deployed and none of my friends were adventurous enough to give it a try. This time Mr. B was back and wanted to run it and I had a friend who is just as crazy as I am and said she’d run it, even though she just had a baby 5 months ago! She rocked the run for sure! Then we stumbled upon a guy she works with who was going to run by himself and told him he could run with us, that made for our crazy team of 2 guys and 2 girls. The best part was that the majority of the course as accessible to spectators so we took our 3 kiddos and the boys were able to take pics and videos of most of the course, I’m so glad they captured it for us! 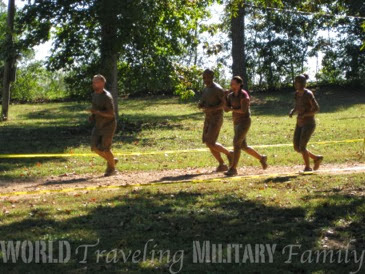 Us getting ready for our FIRST Mud Run, had no idea what to expect, just wanted to survive and finish, LOL! Um, no one told me about all the steep hills we had to run up! That was a killer, especially with me having this cold & sinus infection I am trying to get over! I gladly took the few seconds to rest while I waited for the rest of the team to catch up! The other problem was that I was SO thirsty during the race! 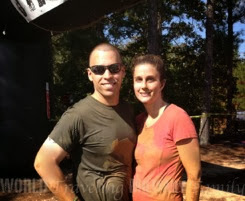 There was water at the first few obstacles and then none near the end, it was horrible! I realized after the race that it was the meds that I’m on for my sinus infection that was making me so thirsty! Wish I would’ve thought of that & had the kids carry water for me! 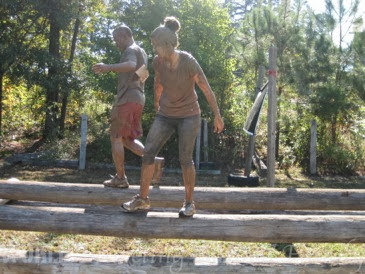 After running up & down the hills the first obstacle was to crawl under these logs in the mud pit, they were so low you had to submerge your head in the water/mud to get underneath! Then you had to jump into an ice bath that was so cold it literally took my breath away and Mr. B had to help me out! I was already trying to catch my breath and that made it almost impossible! The PT leader led the way, trying to hustle the rest of us along. 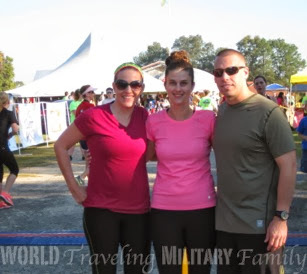 I was the slowest of the group but I was still faster than the other 66 females in my age group, ha! LOL! No rest for the weary with Mr. B leading the way. Going downhill on tires, why were there so many hills?! Wahoo, one of the FEW water stations! Walking across logs, we all managed to stay on them & make it across. 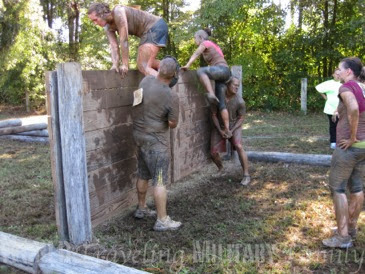 Climbing over walls! 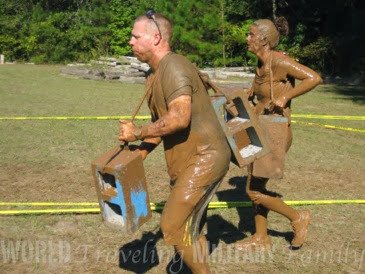 No, that girl isn’t part of our group but that’s the thing about the Mud Race if you see someone who needs help, you help them. 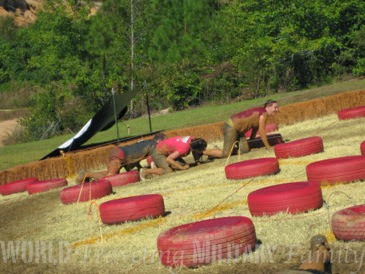 So with this race there was what they called The Blue Lane, which had 5 harder obstacles to complete for those who were physically fit. 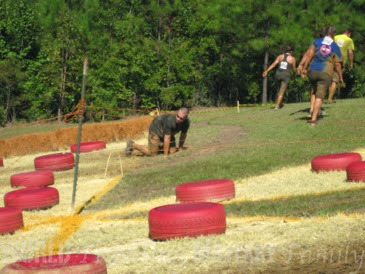 We hadn’t planned on doing the blue obstacles, well at least my friend & I, but Mr. B had other ideas and the other guy was down, so we just went along with it. Little did we know we’d be carrying cinderblocks! 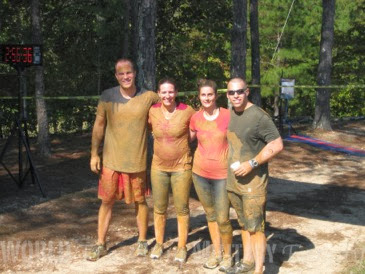 This was #3 of the 5 of the blue obstacles. Why yes, that is REAL barbed wire we’re crawling under! 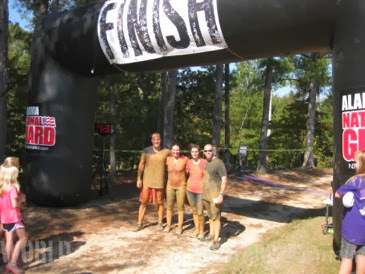 1 hour 22 mins and 45 seconds after we started we finished the Mud Run! Both my pants & shirt are stained from the red AL mud, LOL! Thanks my friend for being crazy enough to run this with me! I’m so glad we were able to do this before I moved! 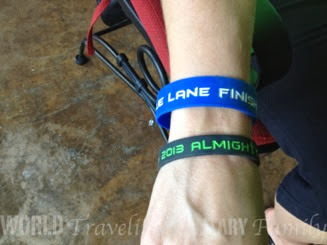 Yep, we were Blue Lane Finishers! 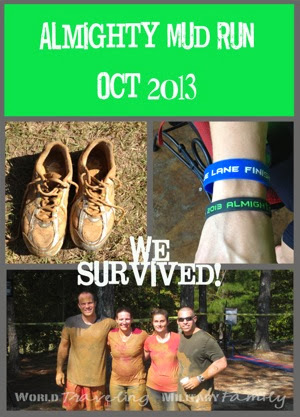 We finished the 5 harder obstacles on the course! So glad Boo & Bub were able to follow along with us and take pics & videos because this was worth documenting! 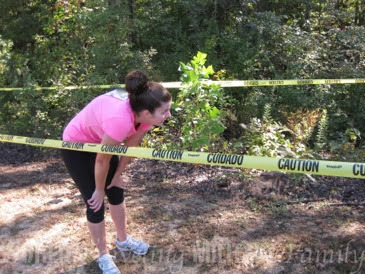 I’m not gonna lie parts of the course were intense, at one point I even asked who’s crazy idea it was to run this thing (um yeah I know mine!) and said I wouldn’t do it again. But literally hours later my friend & I were talking about how it can become addicting, so I’m not ruling out another run just yet. Although I will change a few things for training for the next one for sure, like actually training, LOL!! 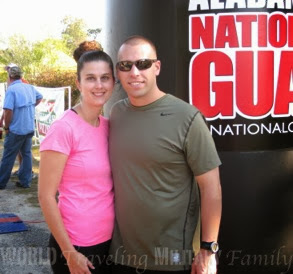 And try to stay healthy the week before the run 😉 Mr. B would like to run one competitively, I know I slowed him down for sure, but it was fun to be able to run it together and I needed his help to get over some of the obstacles! I’ll have some major training ahead if I want to run competitively with him! How fuuuun! I love mud runs. I did one earlier in the year! What one did you do? 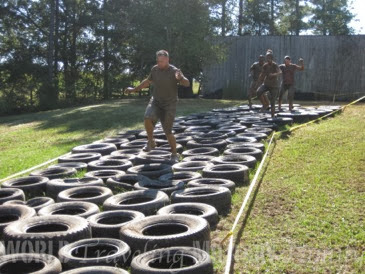 A Tough Mudder? Wow! That’s so awesome. I’m not really a runner and to be honest quite out if shape right now, but I always wanted to do a color run. Oh my goodness, that’s CRAZY! 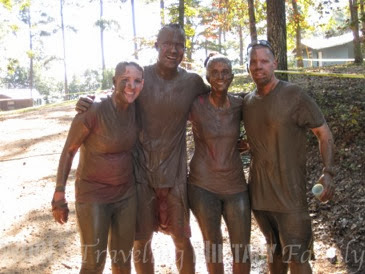 That photo of you guys covered in mud is insane!! So did you end up taping your shoes on? I bet the mud was good for your skin, at least!! Well the email they sent said to arrive an hour early to check in and get your shoes taped BUT when we got there at 8:30 all the tape was already gone 🙁 If we would’ve known that we would’ve took our own tape. 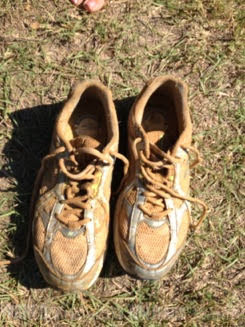 Luckily none of us lost our shoes but someone in front of us did and had to dig it out of the mud! That’s what we said while we were running, people pay for mud baths, LOL! !